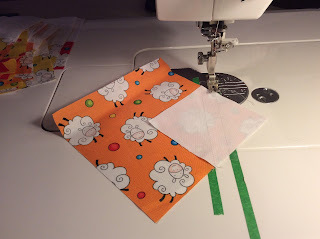 I don't want to have to go to the bother of marking a diagonal sew line on every background square of every snowball corner by either drawing or pressing the line because I just want to start sewing! Also, if I'm going to end up with bonus half square triangles, I don't want to have to go to a lot of additional work for them either! 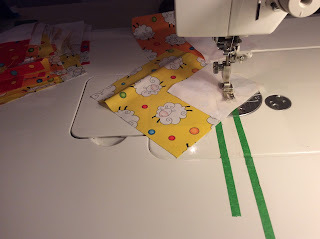 Tape a piece of painters tape, which will not leave any sticky stuff behind when you peel it off, to your sewing machine bed so the left edge of it leads directly to the needle of your sewing machine. Next, leave a 1/2 inch gap and place another piece of tape to the left of your first piece of tape. 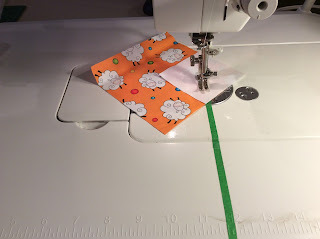 The second piece of tape will need to extend approximately an inch beyond the needle. Lay the smaller background square of fabric RST in a corner of the main fabric square and then line up one point of the background square in front of the needle of the sewing machine with the diagonal point on the left-hand edge of the tape. Sew keeping the diagonal point of the background square of fabric travelling along the left edge of the tape. When you get to the other corner of your first square, line up your next square and keep chain piecing. 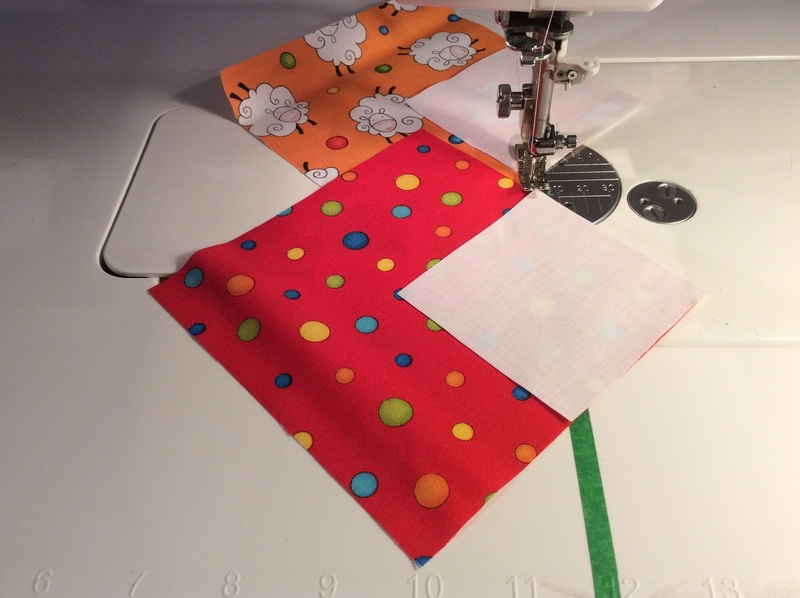 Once you have sewn on all the corner squares it is very easy to sew another parallel row of stitching. 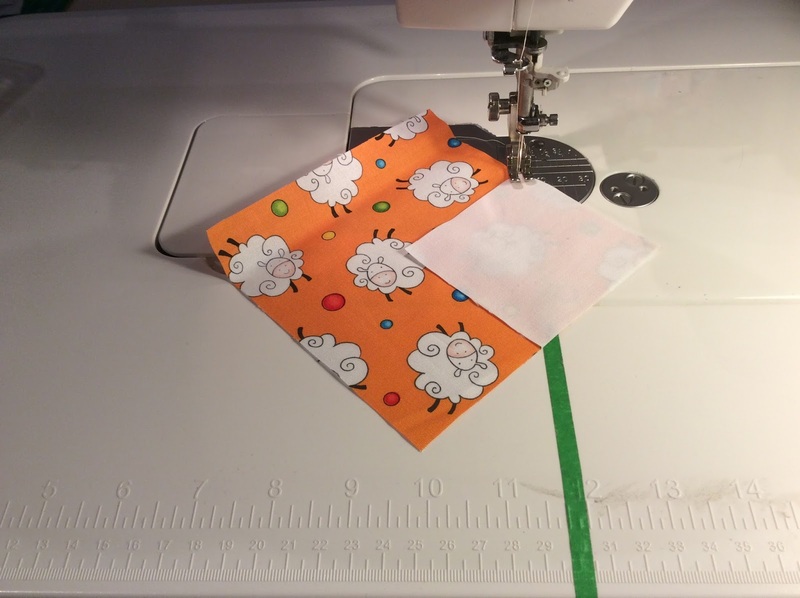 Simply line up the beginning and ending points of your previous stitching line with the right side edge of the left hand tape. 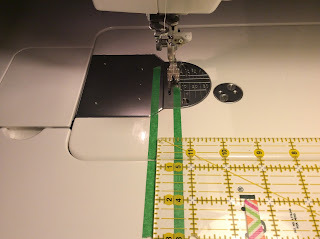 This will give you a new stitching line 1/2 inch away. 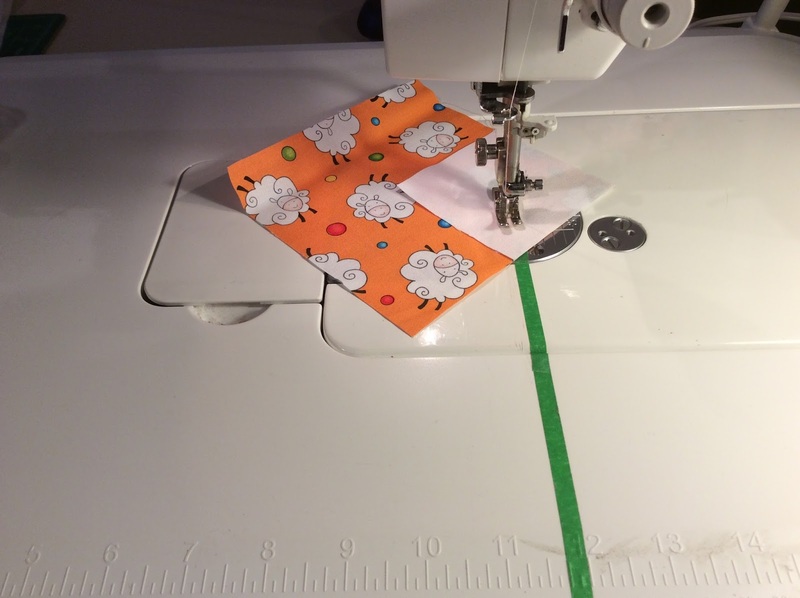 I marked the fabric just to demonstrate where the new stitching line will go. Continue to chain piece your blocks by lining up your previous stitching line with the block you just stitched and the right side edge of the left hand tape. 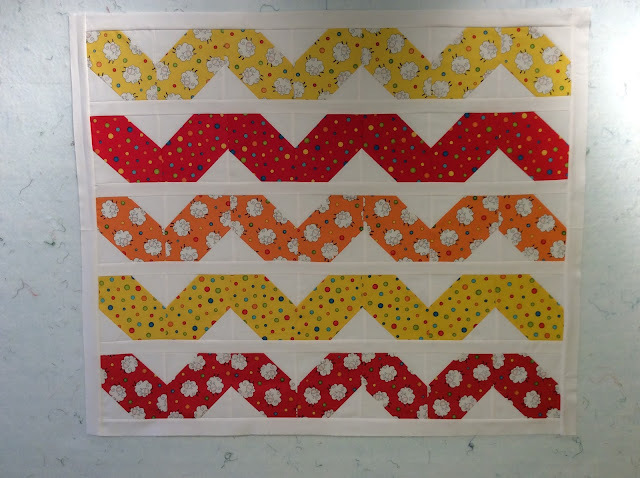 Once both diagonal corners of your blocks have two rows of stitching, it is a simple matter to cut between the two rows of stitching, press back the flippy corners to complete your blocks and press open the cut off triangles to reveal your bonus half square triangles. 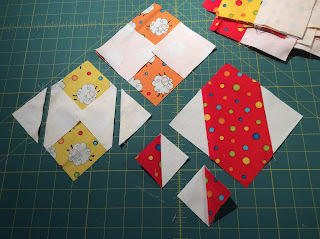 Every block will give you two bonus half square triangles. 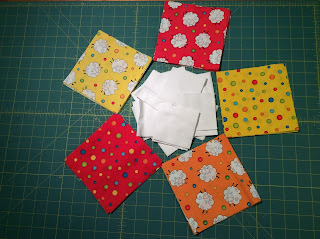 They can be used as is or trimmed to two inches square. 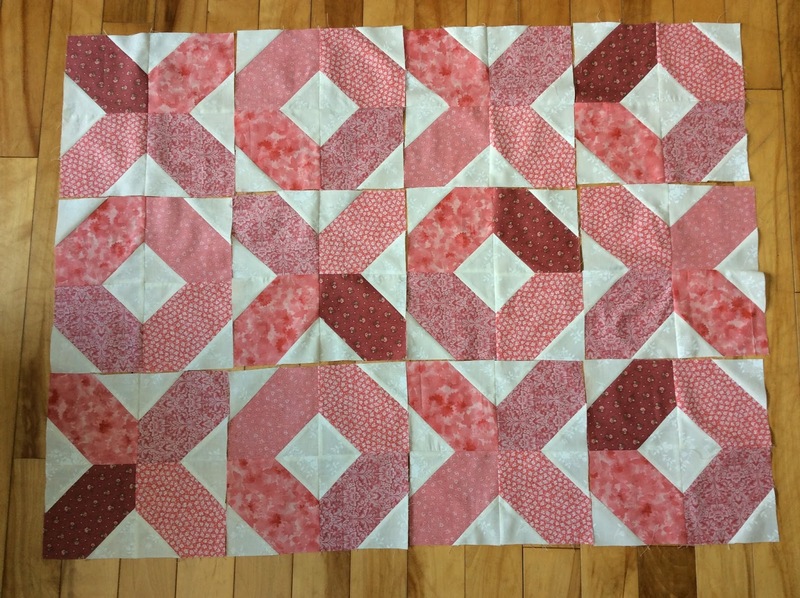 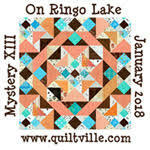 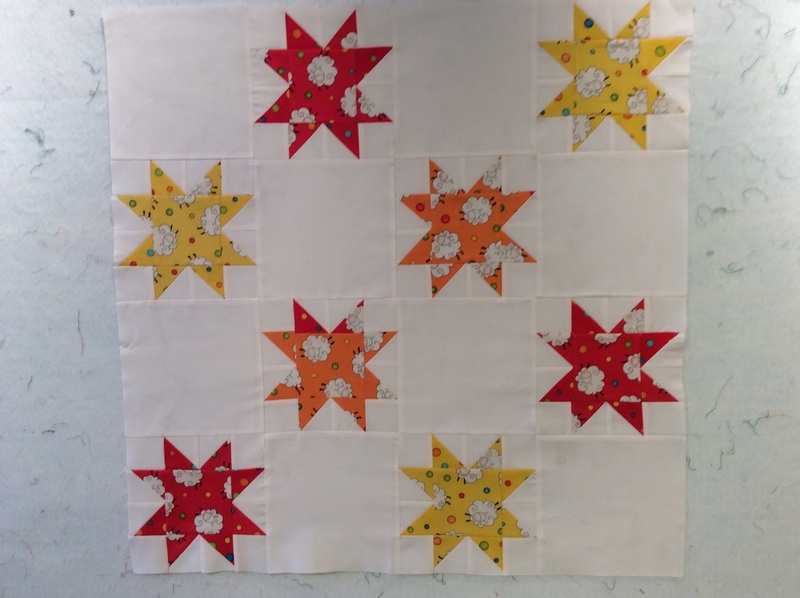 I put this together as I am giving a demo of the block at my quilt guild tonight. 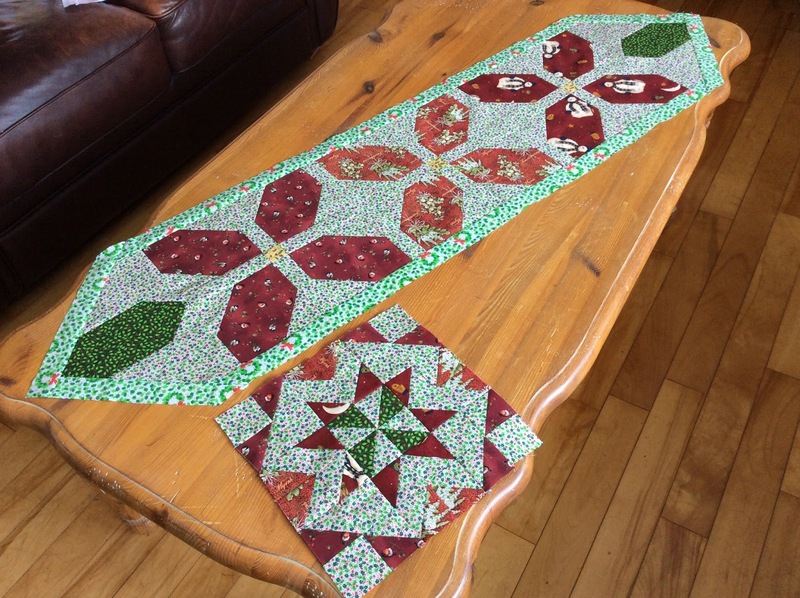 I hope if people come look at this it is understandable! I am also interested to see what my program partner does with her off cut triangles.